Purchasing this digital gift card creates a unique code. The gift card recipient can enter this code at GlamTribal checkout to subtract the gift card value from their order total. GlamTribal will keep a running tally of purchases against the value of the gift card. You will choose to have the gift card sent directly to your email or the gift recipient’s email at checkout. This automated action occurs with every gift card purchase. Standard amounts are $50, $75, $100, $150, $200, $250 and $500. This gift card never expires and includes all current and future inventory on GlamTribal Design @ anneofcarversville.com. If you desire an amount over $100 but not a listed amount, contact Anne@AnneofCarversville.com or use our internal messaging now and we will add it to your gift certificate options within 24 hrs, 7 days a week. During East Coast normal business hours until 9 pm, the addition will be made at once when message is received. We will contact you via your email address for further instructions after receiving notification of your gift certificate purchase. OR, you can contact Anne@AnneofCarversville.com or use our internal messaging now and give us instructions about sending your free gift — to you or to the gift recipient. Please include gift certificate code and your email addy for confirmation of FREE EARRINGS shipment. GlamTribal Design will ship to you or the gift card recipient via first class mail a lovely bamboo blank card with elephant graphic on front in our sage green burlap gift bag. Inside will be more info about GlamTribal Design and AnneofCarversville.com AND a complimentary pair of African jasper elephant charm earrings. The earrings have a highest-quality niobium, Tierra Cast American-made black earwire, making them suitable for the most sensitive ears. The earrings are made of lava balls, speckled bone spacers, and African turquoise (jasper) w/antique-gold brass elephant charms. Absolutely no nickle or lead ever at GlamTribal Design. Gift certificate amounts $150 or higher w/card + earrings will be sent second-day priority mail, not first class. 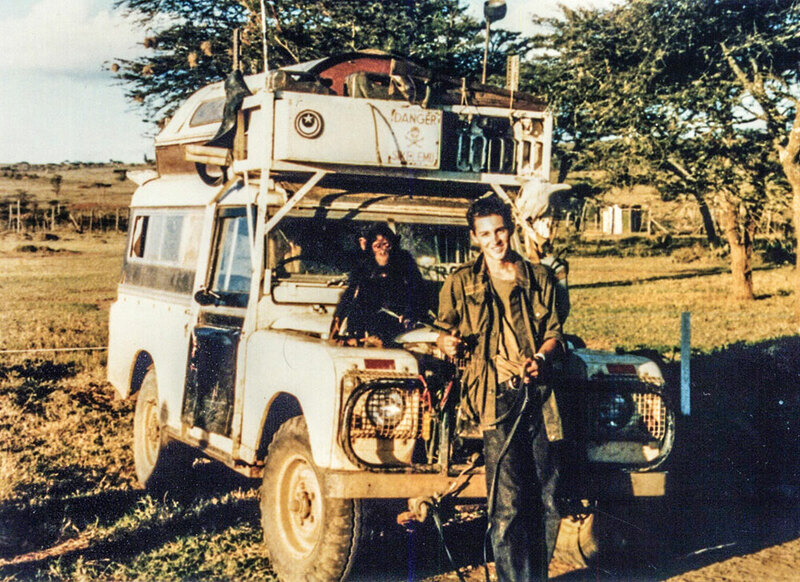 GlamTribal muse Dan Eldon and his Land Rover Desiree. It was my online search for lava beads that brought me to the Omo Valley in Southern Ethiopia in 2012. In a stunning series of events, countless pieces of my life history and connections fell into place. Lake Turkana borders the Omo Valley on the north and Kenya. At that time, I was writing about Lake Turkana and the Great Rift Valley as a key region in Africa giving rise to the birth of humanity. The information in the GlamTribal gift bag will share links to articles on AOC that tells a story that spreads its wings into a life-long commitment to elephant conservation, the admired and beloved Dan Eldon — the young photojournalist stoned to death in Mogadishu — and his mother Kathy Eldon who grew up two hours from me in the Minnesota-Iowa corridor. My emotional commitment to Nairobi and the Kibera School for Girls had flourished for nearly four years before I realized that Dan was always in Kibera, as his home in Nairobi was about a mile away. In an extraordinary sequence of events, I realized that the 3-day window around Dan’s death found me sobbing uncontrollably in a precious African Art Museum in Paris — the Dapper Museum, no longer in its original townhouse. The Dan/Anne stories rolls on to many places, including the surprise broadcast of ABC News Philadelphia from my shop in Lancaster, Pa on the 20th anniversary of Dan’s death. So the incredible young man Dan Eldon will always be our chief muse at GlamTribal, although goddesses are afoot everywhere.